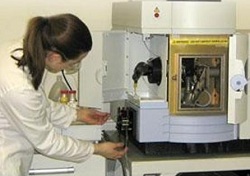 INDUCTIVELY Coupled Plasma – Optical Emission Spectrometry (ICP-OES) is a powerful and sensitive technique employed by Warwick Analytical Service to determine total sulphur in both organic and inorganic samples. The method can be used across a broad range of sample weights, and gives precise determination of sulphur from part-per-million (ppm) to part-per-hundred (%) levels, making it suitable for a very wide range of samples. The first stage involves digestion of the sample, usually by microwave digestion, after which the sample (now in solution) is passed through a nebuliser and aspirated into the plasma. Warwick Analytical Service (WAS) is the laboratory services division of Exeter Analytical (UK), and its sulphur determination method is covered by the company’s ISO 17025 and Ukas accreditations.